How Can I Write The Perfect Text Ad? How Can I Write the Perfect Expanded Text Ad? 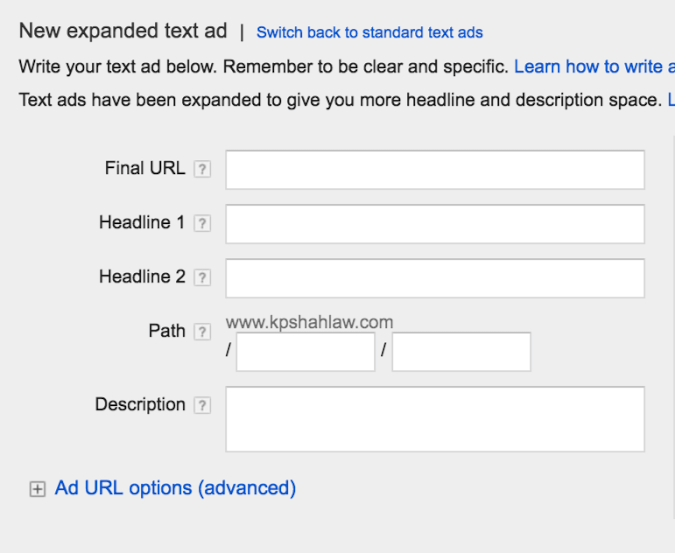 With expanded text ads available in July of this year, you might be wondering how to write the perfect ad for your campaigns! AdWords provides you with guidelines, of course, but you might hit a roadblock when it comes down to sitting down to actually write the ad. Click through Rate (CTR) and landing pages are a key piece of your ad, because CTR measures your click data, and the landing page is where a user is brought after the click. As a side note, you will want to have your landing page mobile friendly, and full of fresh, exciting content. Historically, we have seen advertisers use Dynamic Keywords to make ads more relevant by using a keyword within the ad text. With a new ad format, does it seem that they Dynamic Keywords are performing better? The answer is shaping out to be no. When compared to ads with meaningful headlines, the headline ads came out on top. Now, we have Path 1 and Path 2 for your display link. Should you use both? The answer on that as well is looking to be no. In addition to this, you shouldn’t overuse the same words within the ad, because this seems lazy, and tends to not grab the user’s attention as much as a thoughtful, creative headline does. Above, you can see each section – Final URL, Headline 1& 2, Description and Path. Path is what URL is displayed. The actual URL to the ad is input into the “Final URL” section. When it comes to length of the ad, it is also looking to be that shorter, catchy headlines with an interesting description are the most successful ads. Even though there are more characters for the taking, you shouldn’t necessarily use them. Your ad’s headline should be creative, and pull the customer in! Your description is the place to make a compelling argument, WHY does the user NEED your services? Why should they click on the ad? Remember -AdWords is for the consumer. To effectively market a service or product, you will need to think like the audience you are targeting. Also remember to make use of your negative keywords and search terms. Negative keywords help to refine where an ad shows so that the impressions you pull in are relevant.